There are few in the music business that really are doing justice to yesterday's pop and jazz melodies. One of singers that has excelled at the forgotten art of interpreting standards and swing is certainly Frank Lamphere. Critics agree that he is part of that select group of music professionals that actually have the right sound and the right voice for this genre. His strong and resonant baritone may evoke a 1950s Dean Martin, the swing phrasing might bring Buddy Greco or Nat Cole to mind, the Frank Sinatra imprint is there, but make no mistake; Frank Lamphere is a traditional pop vocalist that has a style all his own. Former vocalist at Jilly's and Peninsula Hotel, Frank regularly works with the highest caliber jazz musicians in Chicago, New York and Las Vegas. He has performed in shows across the U.S. and Italy. Frank is not only a pro singer but music contractor, that is frequently hired by corporations to perform for their important events. Frank has headlined at the Taylor Street Chicago Festa Italiana and Ottawa Jazz Festival. A recording artist, his most recent release of original songs Frank Swings continues to receive airplay worldwide. The lead track "I Never Forgot" is featured in the award-winning movie Theresa Is a Mother. 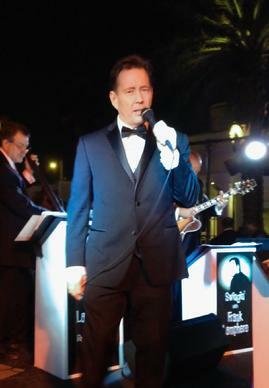 Whether crooning center-court at a "packed" United Center, poolside at the Palms Resort in Las Vegas, or oceanside at the Fountainebleau in Miami Beach, Frank Lamphere delivers an impressive and memorable vocal performance. Frank Lamphere is a rat pack song stylist that specializes in providing musical entertainment for: Chicago Corporate Events, Wedding receptions (full or partial evening), Trade shows and Conventions, Fund-Raisers, House parties, and Concerts. Also available to perform for wedding receptions in Chicago, Milwaukee, St. Louis, Cleveland, Madison, Springfield, Minneapolis, Kansas City, Las Vegas, New York, Palm Beach, San Francisco, Phoenix and anywhere else in the U.S. or Western Europe. "Off the cuff and swinging, spectacularly!" "Has a powerful yet effective voice that switches from romantic balladeer to 60's pop star, on a dime!" "The Latest In a Long Line of Neo-Sinatra's and Really, One of the Best"
"Frank, you knocked 'em dead Saturday night, again!" "His voice, now more than ever before, is a wonderful blend of masculine strength and smooth, rounded edges. Rather than sounding like someone who is hesitant, Frank’s style embodies bridled strength. It’s classy, it’s powerful, but it’s never rude or unkind"
"He seems more modeled on the casual Dean Martin manner, especially in lazy, slow tempo where he slurs and sloshes some vowel sounds"